Forget Stop Losses Or Trying To “Time” The Market. If you wan to make money in the markets, your money must be predominantly invested in the markets. Some dividend growth stocks lost 50% in the crash of 08. However the quality stocks have come roaring back and have kept increasing their dividends to boot. Stock market look toppy. Money flow numbers are declining, moving averages want to cross. Nevertheless we wont be selling our underlyings. When I started out in my investing career, I used stop losses quite a lot. I think the first strategy I learned was momentum trading where I would buy a stock when the moving averages had crossed over and then immediately put a stop loss below my entry price. It wasn’t a bad strategy and is still used to this day but its a capital gain strategy, not a passive income strategy. Also if your stop loss gets hit, you lose money – which I hated at the time and still do. It was technical analysis, not fundamental analysis like we learn here on Seeking Alpha. I have been around the block in investing, from technical analysis to swing trading to day trading to options/futures but in my opinion the best long term investment strategy is investing in dividend growth stocks. Why? The reasons are multiple. This point is key. Many traders/investors lose money every year trying to “time” the market. Furthermore the time involved in producing the technical analysis and managing trades is huge. To invest massive time into your investing but still make a loss is futile. On the contrary your income could easily grow 5 to 7% per year passively just by holding quality dividend growth stocks and re-investing the dividends. This frees up your time so you can have other income generating activities. “If you do the right thing at the wrong time – you get pain”. As you can see, dividend payments actually increased in 2009 so our income would have gone up. Let’s confirm it by running the numbers. This stock was trading at roughly $82 a share back at the start of 2008. Therefore your $70,000 investment would have given you approximately 853 shares. Let’s take this one step further. If you confirmed that the fundamentals of the stock were still intact and then invested the dividends from the 4 quarters listed above back into the stock, what would have been your 3M income in Quarter 2 – 2009? Well $1714 would have bought an extra 38 shares when shares were on the floor at $45 an ounce. What would these extra shares have done to our income in Q2 2009? ($1,011 per quarter – almost $600 more per quarter than Q2 2008 !). What is the takeaway from this article? If you are investing for income and you trust your underlyings (they must pass strict fundamental analysis), then have the courage to hold on to them during stock market crashes or mini crashes. You use the dividends to buy more which will make a vast difference in your annual income long term. Look at the S&P500 at the moment, the market definitely looks toppy (see chart below). The moving averages are threatening to cross over, money flows are definitely diverging and the percentage of stocks holding above their 200 day moving averages are definitely on the decline. 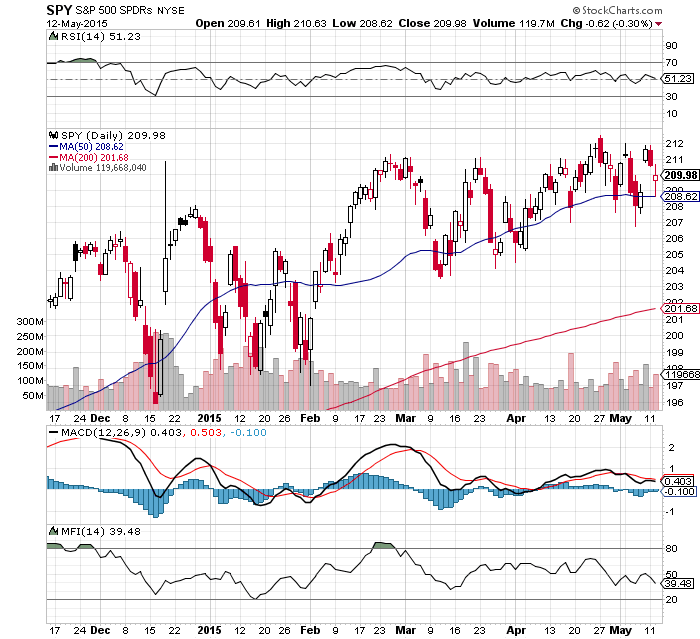 As I write the SPDR S&P 500 ETF Trust(NYSEARCA:SPY) is hovering around 2,100 but looks weak at these levels.. Nevertheless, there will be no interference from me here in our portfolio. My goal is income and my underlyings have proved that they will raise their reimbursements through the worst of stock market declines. This entry was posted in Trading and tagged (NYSE:AXP), (NYSE:BDX), (NYSE:BUD), (NYSE:DEO), (NYSE:IBM), (NYSE:K), (NYSE:KO), (NYSE:PG), (NYSE:WFC), $1, 011 per quarter - almost $600 more per quarter than Q2 2008 !).. Bookmark the permalink.